Scientists have shown that a warbler found in Pennsylvania is the offspring of a hybrid mother and a father from an entirely different genus – a combination never previously recorded and resulting in a three-species hybrid bird. 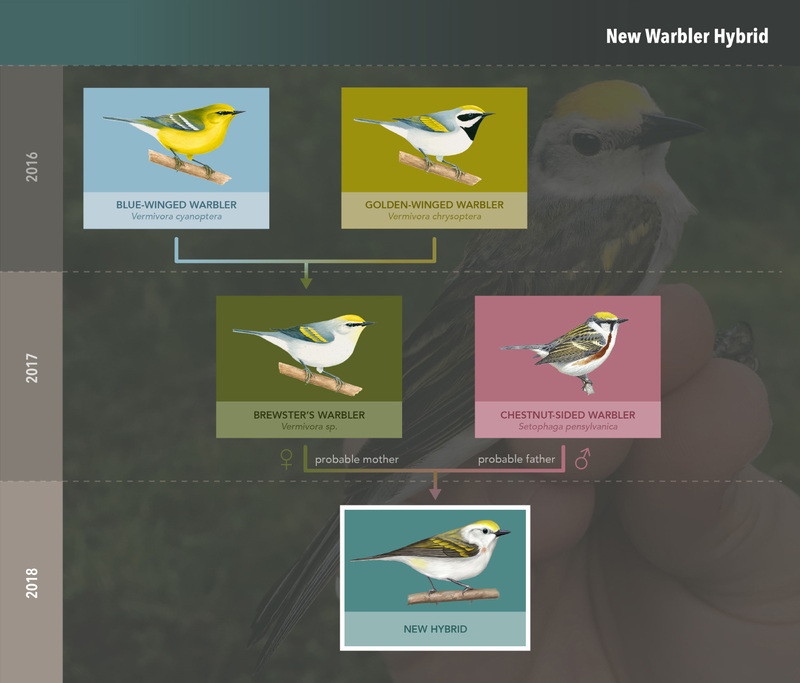 The findings, which have just been published in the journal Biology Letters, are unprecedented: a female hybrid Golden-winged × Blue-winged Warbler, also known as a Brewster's Warbler, mated with a male Chestnut-sided Warbler and successfully reproduced. The 'triple hybrid' warbler, which is the offspring of a Brewster's Warbler mother and Chestnut-sided Warbler father, photographed on 24 August 2018 (Lowell Burket). The unusual offspring was first noted in Roaring Spring, Pennsylvania, in May 2018 by local birder and eBird contributor Lowell Burket. Here, on a family-owned property, Burket photgraphs and videos birds, and it was in one piece of video that he first noticed a male warbler that sang like a Chestnut-sided Warbler, yet had some of the physical characteristics of both Golden-winged and Blue-winged Warblers. Burket saw the bird again a number of times, reported it to eBird, and got in touch with researchers in the Cornell Lab's Fuller Evolutionary Biology Lab. "I tried to make the email sound somewhat intellectual so they wouldn't think I was a crackpot," Burket recalled. "Having the photos and video helped. Within a week researcher David Toews came down. We found the bird again and collected a blood sample and measurements. It was a very interesting and exciting morning for us. A few days later I got a text message from Dave saying, 'You were right!'" The key to identifying the triple hybrid's parents came from genetic analyses. "We looked at the genes that code for different warbler colours," Toews explained. "This way we could recreate what the hybrid's mother would have looked like – the avian equivalent of a detective's facial composite, but generated from genes. We confirmed that the mother would have looked like a Brewster's Warbler and the father was a Chestnut-sided Warbler." Graphic showing the predicted family tree of warblers leading to the three-species hybrid. Graphic courtesy of the Cornell Lab of Ornithology. Hybridisation is common among Golden-winged and Blue-winged Warblers. This has been of particular concern for Golden-winged Warbler, which has declined dramatically in some areas. However, hybridisation has never before been recorded between these species and Chestnut-sided Warbler. This type of rare hybridisation event may also occur more often in the declining warbler populations of Appalachia, because there is a smaller pool of mates from which to choose. 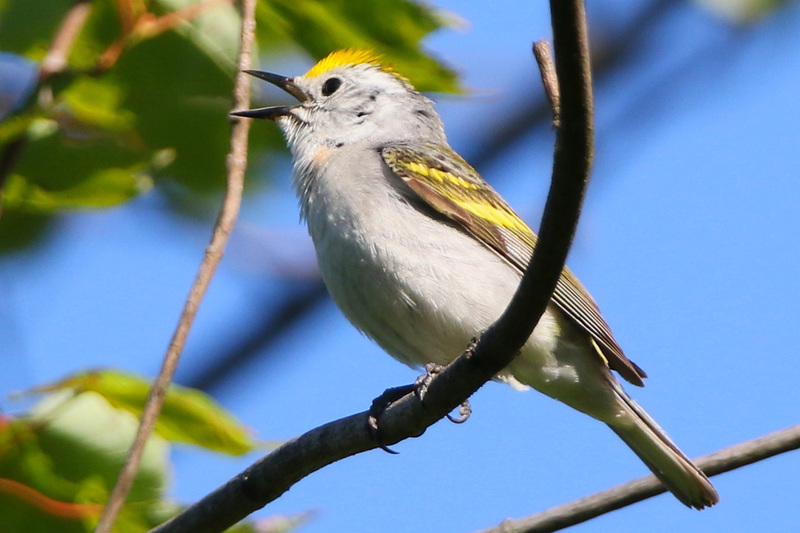 Towes added: "That this hybridisation occurred within a population of Golden-winged Warblers in significant decline suggests that females may be making the best of a bad situation. "It also tells us that wood warblers in general have remained genetically compatible long after they evolved major differences in appearance." 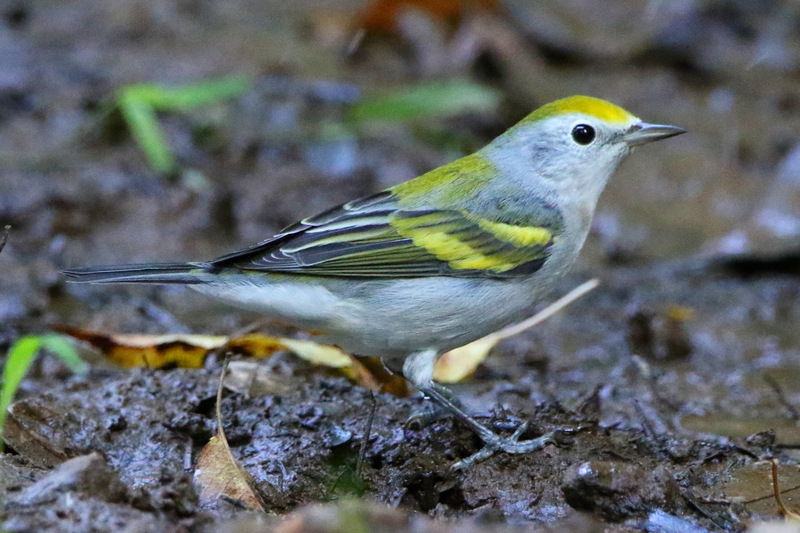 The 'triple hybrid' warbler photographed in song at Roaring Spring, Pennsylvania, in June 2018 (Lowell Burket). Scientists intend to keep a keen eye on the location next spring and summer in order to see what the future holds for this extremely unusual hybrid warbler. Whether it returns and either fails or succeeds to attract a mate remains to be seen. Toews, D, Streby, H,Burket, L, & Taylor, S. 2018. A wood-warbler produced through both interspecific and intergenetic hybridization. Biology Letters. DOI: 10.1098/rsbl.2018.0557.